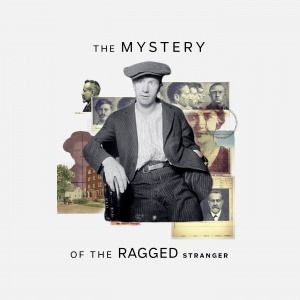 The Mystery of the Ragged Stranger podcast can be listened to below on SoundCloud or on iTunes or Stitcher. The Ragged Stranger blog has tried to highlight some of the information uncovered in my research that didn’t necessarily fit into my upcoming book on the crime- Kisses for Julia, Bullets for Ruth: The Mystery of Carl Wanderer and the Ragged Stranger. Today, I’m pleased to announce The Mystery of the Ragged Stranger podcast which will air every other Monday with a total of eight episodes. For a sneak peak into what the podcast will cover, please read the intro below. Hello and welcome to the opening episode of The Mystery of the Ragged Stranger. My name is Michael Hendrychs and I will be your host. This podcast aims to take a deep look at what was one of Chicago’s most famous crimes. In 1920, on a quiet northside street, three people entered a tiny vestibule of a two-flat. Ten gunshots later, only one person emerged. World War I, mental illness, love affairs, Chicago Police shenanigans, the first John Doe murder trial in Chicago history, Illinois politics, and the writings of one of the period’s most illustrious writers, are but a few of the topics we will touch on. The chapter went on to tell the story of a double murder committed in our vestibule, the very vestibule I was sitting just a few feet away from. The book went on to tout tales of ghosts, being seen or heard, both inside and outside our house, and my own interaction with a spirit, will be discussed in a later episode. While I had typically never been a big fan of ghost stories myself, I was fascinated by the Ragged Stranger story and I wanted to know more about the normal, rather than parnormal, facts of the story. We know it wasn’t Earl Keesee or Joseph Ahrens. Both of those men were identified, by their own family members, as having been the Ragged Stranger, yet both of the men turned out to be alive and well. We’ll take a look at all of these men, each with their own compelling stories surrounding their identifications. I will explain why each man can, or cannot, be the Ragged Stranger. The Ragged Stranger was front page news in 1920 and 1921, from The Seattle Star to The Palm Beach Post. What you will hear is taken from hundreds of newspaper articles, and dozens of books. Court files thought to have been long lost to a fire were found. Weeks of sitting at the Newberry library, staring at microfilm, led to eyeglasses for your humble storyteller. Military records from the US Army, as well as from our neighbors in Canada, were studied. Contacts were made with UK historians and several interesting facts in the story come to you from across the pond. I have tried to use only facts that could be backed up by multiple accounts; you will hear examples of how single accounts have been spread like ‘Chinese whispers’, and been erroneously reported elsewhere, and then repeated over and over in the ‘copy and paste’ world we live in. Contemporaneous reports will be compared to some narratives that shockingly didn’t emerge until over 50 years after the crime happened. These narratives will be discussed and how they went off the rails will be explained for you to make your own informed decision on what to believe.